Here is what I actually did to make these bars. While I’m willing to tell you what I did, it seems unfair to link that to the original recipe which probably isn’t at all properly reflected in my final result. Coat 13″ x 9″ pan with cooking spray and dust with flour. 1/4 t. baking soda in small bowl. 2 T. milk not realizing I was going to beat until smooth). Add flour mixture to large bowl and beat at low speed until combined. Fold fruit and cereal into batter. Spoon batter into prepared pan. 1/2 c. flaked sweetened coconut. Sprinkle coconut on top. Bake until golden ( about 25-30 minutes. Cool completely in pan on wire rack. 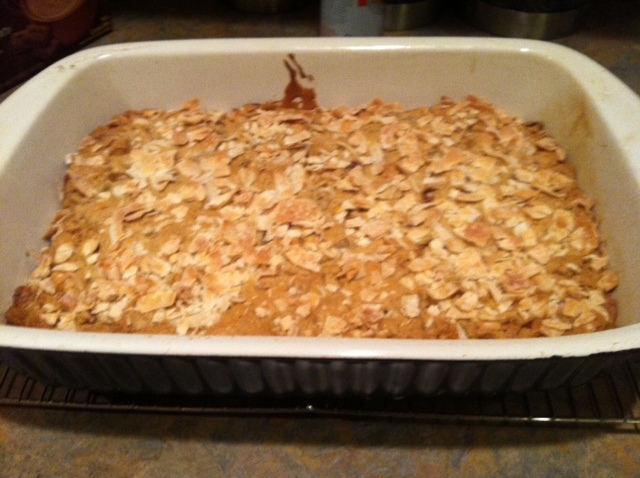 This entry was posted in Recipes and tagged coconut, dried fruit, granola bars, whole wheat flour. Bookmark the permalink.